On location filming in Laos. 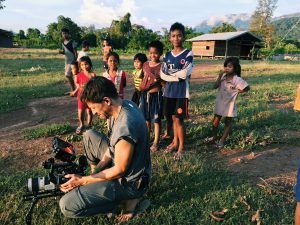 Filmmaker and Pulitzer fellow Erin McGoff is currently running a 30-day Indiegogo crowdfunding campaign to help raise part of $37,000 to finish her ambitious documentary exposing a horrific U.S. tragedy in Laos. During the Vietnam War, the United States secretly bombed Laos more heavily per capita than any country in history, McGoff said. There are 80 million unexploded bombs remaining that continue to terrorize, kill and maim innocent Laotians today. 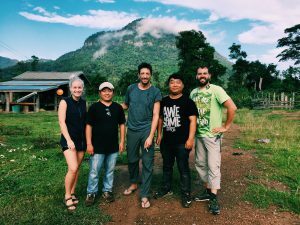 The film crew on location in Laos. One day during this program, McGoff said she was out with a demining team in Phonsavan, Xieng Khouang Province in Laos. She watched how the team tediously worked to find and destroy the 80 million bombs, one by one. At the end of the day, they let her colleague click the button to detonate the bomb. “I’ll never forget how loud it was,” McGoff said. The Indiegogo goal was surpassed with two days remaining on the campaign. That says a lot more than just reaching the monetary amount, she said. McGoff said she is excited to move on to the next phase of post-production. She and her team are currently refining the editing process with motion graphics, titles and archive footage. The next phase will be to add the musical score from two-time Emmy-Award winning composer Jeremy Zuckerman, followed by additional sound design, she said. McGoff said she plans to tour the film all of 2019 in the hopes of educating more Americans about Laos and starting a national conversation, but she has to raise funds to finish the film first. The fundraising campaign will end on July 6th at midnight. This film has been supported by The Pulitzer Center, NextPix, and World Without Mines.